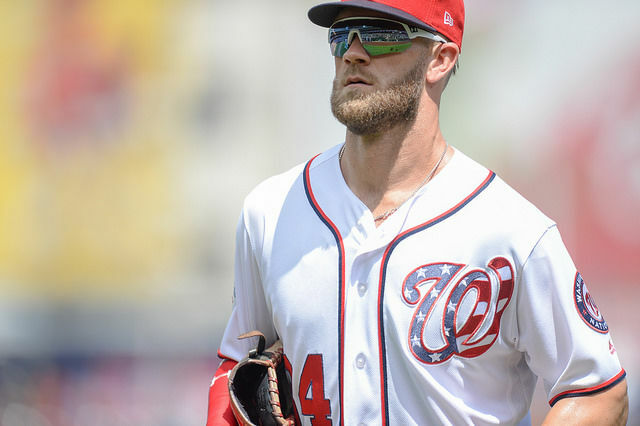 Bryce Harper explains his thoughts on the season and his future in an exclusive conversation with The Sports Capitol, shared here with WTOP. He’s open to a return, which assures nothing. WASHINGTON — Bryce Harper began packing two weeks ago. He placed two large cardboard boxes next to his black-and-red folding chair that faced his locker and held his weight. He tried to figure out where to start. Harper sorted boxes of shoes, threw trinkets into the box. He appeared partially surprised at just how much had accumulated within his double locker during what could be his final season in this stall, one he’s occupied since before he could legally drink. Gone from the top were the meticulously displayed fielding gloves, usually curved into each other like Russian nesting dolls. His Home Run Derby trophy had been removed weeks ago from atop the cooler to his left. Extra shirts, shorts and bobbleheads were boxed. Only the necessities — shower shoes, uniform, a glove, bats in boxes and his omnipresent black, steel-framed bat case — remained by Monday afternoon as the most-talked about ending in Washington Nationals history approached. 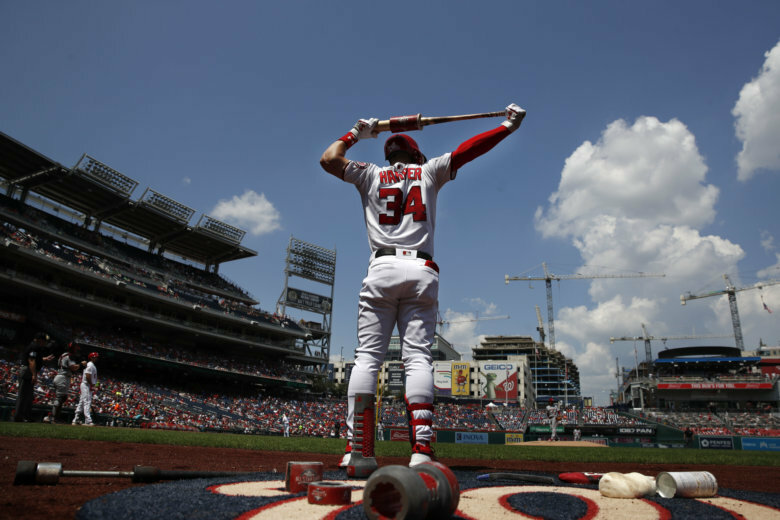 On Wednesday, in front of a sparse crowd during a bland day game against Miami, Harper is assured of jogging to right field in Nationals Park for the last time. A road trip to Colorado concludes his sixth season in Washington. Winter’s free agent mayhem begins a month later. What could be Harper’s final season in Washington played out in three acts: It began with a spring training threat to walk out of his news conference if asked about free agency before moving into a low-average first half; a reprieve from the intensity came in his home ballpark during the All-Star break; he excelled personally in the second half while his team leaked. A fight is coming next. Scott Boras, Harper’s agent, began stumping on behalf of his client midsummer. Team owners are prepared to counter his hyperbolic valuation. Phrases such as, “Once in a generation” will be opposed by, “. 214”, which was Harper’s astonishingly low average before the All-Star break this season. Sportsbooks already have odds on Harper’s future playing home. The Cubs come in as favorites at 3/2. The Nationals are fourth at 7/1. The Dodgers and, of course, the Yankees fill in the middle. But, the Nationals believe their chances are as good or better than any other team. They have millions coming off their payroll. They will, on paper, again be a threat. They have also brought Harper from professional infancy to a place where he routinely proclaims his affinity for the city. Since arriving at 19 years old, Harper has gained control. He no longer runs into walls or verbal missteps. Everything outside of balls, strikes and salary operates on his terms. The environment has helped him arrive there. The Nationals believe they win all the tiebreakers. The question will be cost. “There was just no point in talking about it then,” Harper recently told The Sports Capitol. The performance kept with a propensity for eye-opening debut performances. The year before, Harper strongly hinted he was injured during his 2016 downturn, something the Nationals vehemently disputed. This season, the threat. ESPN was at the news conference. Harper’s stance did not carry the sound bite panache of “Where’s my ring?” but it was enough for headlines and ledes. Even when Harper tries to say nothing, a mission he embarked on this season with gusto, it turns into something. 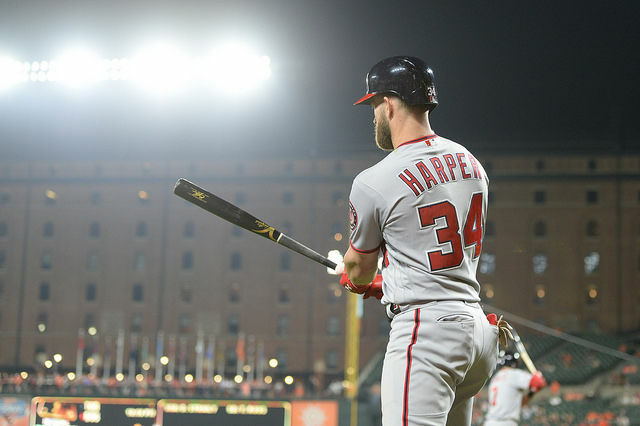 “I’ve been dealing with the media since I was 16,” Harper told The Sports Capitol this season when asked if he is ever surprised by the run on his words. Two home runs April 1 sent Harper out of the season-opening series in Cincinnati with four hits and a 1.429 OPS. He walked 37 times that month. At 25, Harper received treatment reserved for Barry Bonds when the slugger moved into his 30s. The patience was admirable. However, the process was beginning to irk Harper. His average fell to .241 by the end of April. Davey Martinez made a desperate attempt to salvage the dropping number by moving Harper to leadoff in May. The experiment failed. He hit .217 there, his on-base percentage dropping to a paltry .288. Harper struck out twice as much as he walked. Previously being patient bred impatience. May sheared another 20 points from his average. He struck out almost three times as much as he walked in the month. June was worse — a harrowing .188. The All-Star break was the only thing to stall the slide. Harper was hitting .214 when Martinez rested him the final Sunday before the schedule paused. Theories to explain the dip ranged from feeling the pressure of a contract season, to Boras’ stance the league was unfairly pitching and shifting against Harper, to Harper’s simplistic notion he was simply missing good pitches to hit. He contended then he was not frustrated, which is difficult to believe. Harper reiterated the stance in the conversation this week. “I think I’m pretty truthful with you guys,” he said. “When I say something, I usually mean it. I think for me, it was just enjoying it. Not get too high or too low. Like I said, knowing I have a second half coming, I was more worried about us as a team and trying to win ballgames. I’ve said this a lot, too, there’s a lot of things in life that are bigger than baseball. Up next was another years-in-the-making event for Harper. 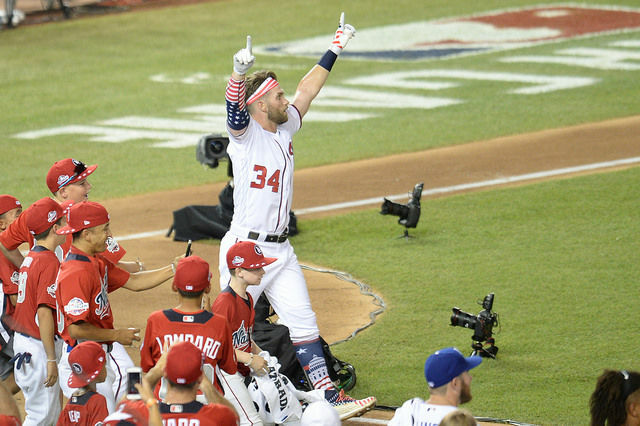 The All-Star Game, Home Run Derby and every ounce of focus was coming to the District. He was easily voted in. He kept his promise to participate in the Derby. Two years after campaigning to make baseball fun again, could Harper take three days and enjoy himself? Media Day, Harper would be stuck. He couldn’t threaten to walk out if he didn’t like a question. A Nationals media relations representative escorted him to his table. Cameras began to set up before he arrived. No National League player received more attention. Delicately, the possibility of his departure was asked about following a long answer about his connection to the city. The three days seemed to reboot Harper. He developed a friendship with Atlanta first baseman Freddie Freeman that could work as a screenplay for a buddy cop movie. They joked in news conferences. Harper requested Freeman be stationed next to his locker in the home clubhouse. He had been so intense for so long it was easy to forget the unabashed approach he previously took, that there was joy in there somewhere, not just someone who appeared to lock things away from public consumption after living so ravenously in plain view. Harper’s derby apparel delivered an ode to the District. He was a walking dose of Americana coming to the plate to hit homers off his father, Ron, bald with a bushy beard and the clear supplier of Harper’s stocky physique. The Capitol building climbed up Harper’s socks; his right arm and bat head were encompassed by variations of the U.S. flag. A headband held his long talked about and luxuriously pampered hair. Down 18-4 with 2:38 to go in the final round, Harper called timeout, then shook his head. “F**k!” he yelled. Max Scherzer told him he was all right. A bit of a run, then another timeout with 1:20 to go. He roared, victorious, 10 minutes later. Harper shared the winning trophy with his dad and a singular moment with the fans. After offering only stern-faced answers all season, enjoyment of the night caught up to him in the news conference. The Home Run Derby trophy sat atop a mini-fridge when the second half opened. Harper went 1-for-4 in the opener, then 2-for-4 in his second game. He pulled his average to .223 by the end of July. Adjustments were benefiting him. He moved his hands away from his face (an adjustment he declined to talk about for fear it would make him start thinking about it) when he came set in the box. The change reduced the amount of time his hands needed to load for a swing and straightened what was a small loop. More hits came through August. His average for the month landed at .324, his OPS .959. This was the player Harper expected himself to be. A .976 OPS since the All-Star Game stopped Boras’ proselytizing about shifts. Harper gave a little into the disappointment his average brought. He also turned to big-picture philosophy when discussing it. Max Scherzer enjoyed four years of watching Harper. He admires the patience Harper developed. Scherzer, 34, also laughs at the 25-year-old version of himself. His significant growth since then causes his amusement when reminiscing. Now serious, Scherzer has a warning for Harper: They’re coming for you. Not in a good way. Entering free agency is similar to the discovery process in a trial. Your life is opened from all sides. Scherzer signed a $210 million contract. The number is inconceivable to any normal person. “It’s inconceivable to me, too,” he said with a laugh. The projections for Harper are extreme and should easily surpass that mark. They also cut his options. Only a handful of teams have the money and positional need for his services. Half of those teams could well choose similar production from an infield spot, subsequently pushing their cash toward Manny Machado. Each club is going to try to drive down cost, the Nationals included. The Nationals were eliminated from postseason contention Saturday. They’re left to hunt for motivators the final week of the season. Harper is creeping toward a .250 average, a .400 on-base percentage and just reached 100 RBI. He’s already set a career-high in walks (and strikeouts). By OPS, this will be his third-best season. By WAR, only one season, 2014, when he played just 100 games, will be worse. Bet that will come up. For all the caveats about youth, Harper’s performance has fluctuated. His 2015 MVP season was followed by a massive downturn in 2016 before he rose again in 2017, then lurched backward in 2018. It’s easy to hear the head of a front office — or even an owner — across from Boras stamping a finger onto a meeting table while pointing out such volatility. Harper’s early locker packing indicated he understood the state of the season. It was more housekeeping than capitulation — and his recent performance showed no waning. This year wasn’t going to turn, at least not team-wide, and the time to start thinking about what’s next had arrived, finally. Questions about it are now authentic, not posturing. The MLB Winter Meetings are in his hometown of Las Vegas, of all places, this year. Harper has wrested control of everything in his life other than his salary. He finally has that chance, and all of baseball will watch for his decision. Todd Dybas is the managing editor and co-founder of The Sports Capitol. He has spent 17 years in the sports editorial industry, working as a writer and layout editor, winning multiple awards in both positions. He has been an NFL beat writer, has worked as a member of the Baseball Writers’ Association of America for seven years, and is a member of the Pro Basketball Writers Association.